Major hostilities of World War I were formally ended at the 11th hour of the 11th day of the 11th month of 1918. In the U.S., we commemorate this on Veteran's Day each November 11th and honor all of our country's vets. This year, will be even more significant as the date will be 11/11/11. It’s amazing what you can learn with one clue to get you started. Reader Scott D. sent me a digital copy of an old UPI wire service photograph from June 1966. 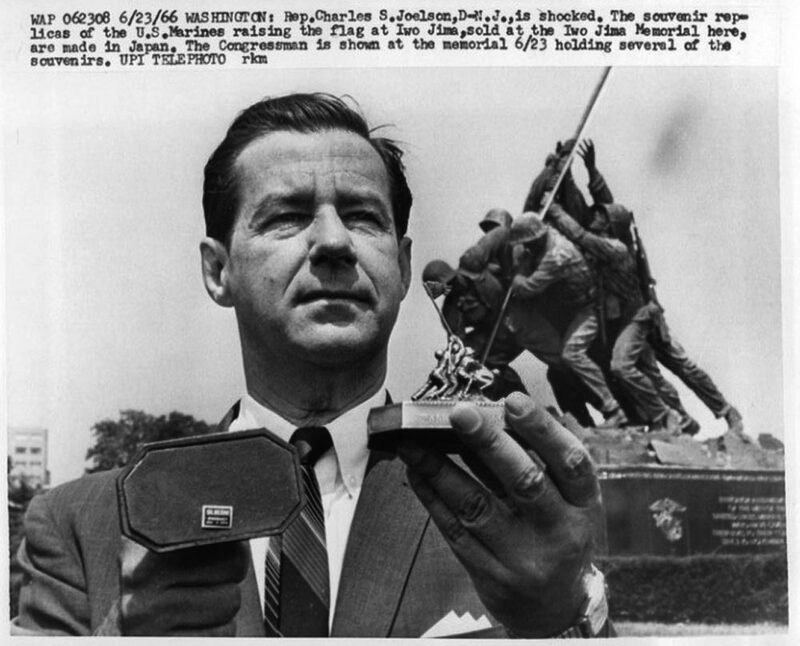 In the photo, then Congressman Charles S. Joelson, Democrat from N.J., holds two metal souvenirs of in front of the Iwo Jima Memorial in Arlington, Virginia. The congressman is shocked that the miniatures of the memorial are made in Japan. Seems he as upset that the U.S. fought the Japanese for the island of Iwo Jima, and then in 1966, the souvenirs were then made in Japan. It’s an age-old and reoccurring controversy about where things are made: overseas or domestically. We can also glean from the caption that there was a souvenir shop or stand near the Iwo Jima Memorial at one time, but is no longer there. Another controversial souvenir from Iwo Jima is beach sand. I’ve written in the past about the Iwo Jima Memorial and souvenirs. I have a gold tone pencil sharpener replica of the USS Arizona Memorial in Pearl Harbor, it was also made in Japan.